Jérôme Dupont was in New York City for a professional Domaine Dupont Calvados Tasting at the Nomad Hotel, located on Broadway in New York City, an event organized by Robert Kacher Selections, Domaine Dupont Calvados distributor. 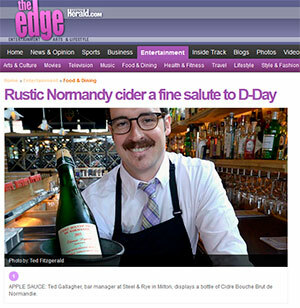 The Boston Herald – The Edge has recently published an article on the cider cocktails made by Ted Gallagher from Steel & Rye in Milton, Massachusets. 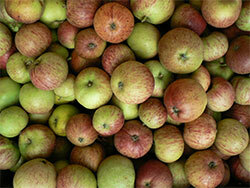 This article was written by Kerry Byrne, a true cider connoisseur. Build in mixing glass. Add ice, stir. Express orange oil lightly over surface, discard. 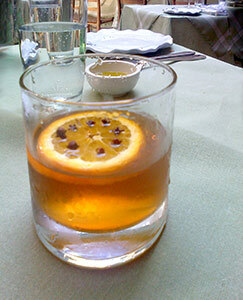 Clove studded orange wheel as garnish. The Palma restaurant is an organic italian restaurant in New York City which remains faithful to generations of family recipes and techniques. 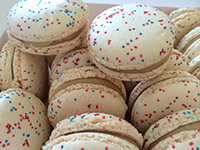 Hong Kong’s Le French GourMay celebration, Great Food Hall brings the finest flavours of France to adventurous foodies to discover from May 9 till May 21, 2015. So far, the cheese tasting with Dupont Reserve Cider has bought a great response from the customers: They are impressed with such a high quality cider. Great Food Hall – LG1, Pacific place, 88 Queensway Admiralty, Hong Kong. Calvados Dupont at the 2015 Calvados Nouvelle Vogue cocktail competition (U.K. preselection). 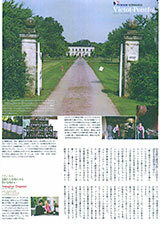 (extract) Fifty years ago, there were about 15,000 Calvados producers in Normandy. Most of these were apple farmers who distilled for personal consumption, much of it rough stuff that became known by the slang term calva — indeed, the sort of thing old men drank with their morning coffee. 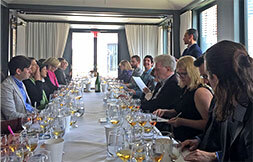 Now, only about 300 producers of Calvados remain, and only about 20 brands are known outside the region. 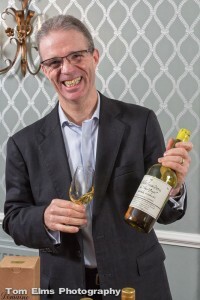 But a serious group of younger producers, who have banded together under the name Esprit Calvados, is bringing Calvados into the 21st century through innovation and experimentation, as well as by reclaiming traditional farming and distilling methods. 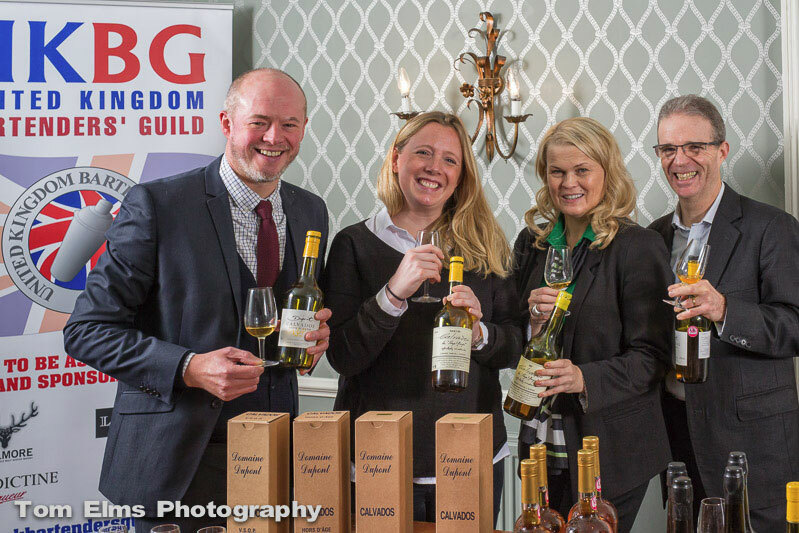 Reaching up from the roots of the farmhouse distiller, the new-wave Esprit Calvados collective consists of some of the most highly regarded Calvados producers: Domaine Dupont, Calvados Christian Drouin, Calvados Roger Groult, Domaine Pierre Huet and Le Père Jules. Each distillery is run by a son, each in his 30s or 40s, who has taken over from his father in the past decade. 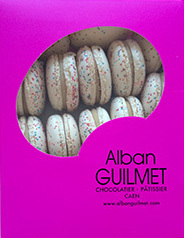 The World Leaders gathered for lunch at the Château de Bénouville have tasted the macaroons created by the awarded Chef Alban Guilmet and made with Domaine Dupont Calvados Cream. 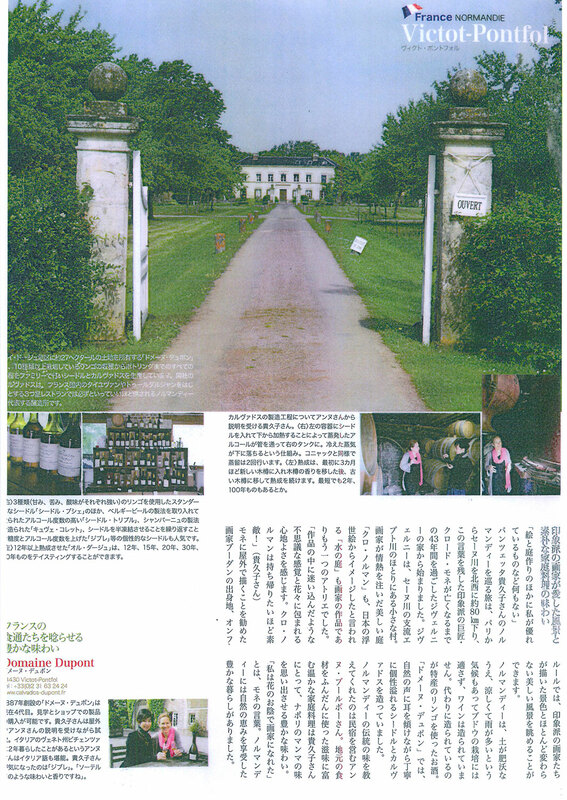 Following a visit at the domain, the Japanese magazine HERS recently included a feature article on Calvados Dupont. This new Youtube channel presents a recipe of « Chocolate fondant with calvados« . The Calvados is Domaine Dupont Vieille Reserve. A nice video, with warmth and humour, very well done… and it does look tasty ! 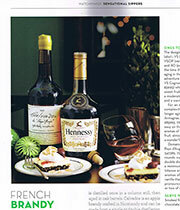 The Holiday 2013 issue of LCBO Food and Drink magazine (Ontario, Canada) has a nice mention of the Domaine Dupont Calvados VSOP. 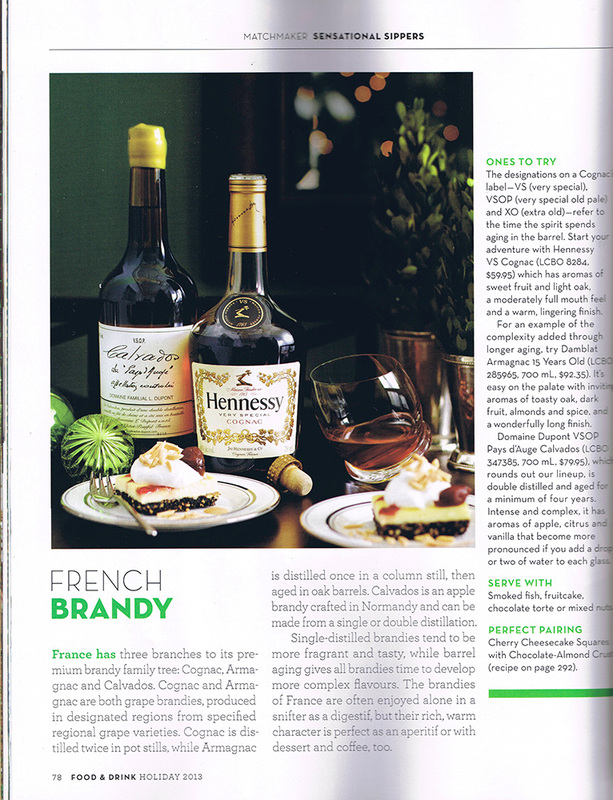 Titled « French Brandy », the article introduces the three major french brandies : Cognac, Armagnac and Calvados. 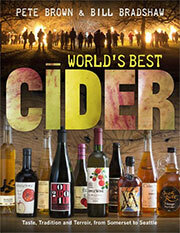 World’s Best Cider is a brand new book by Pete Brown and Bill Bradshaw. Very well documented, it is undoubtly the best book on the subjet. 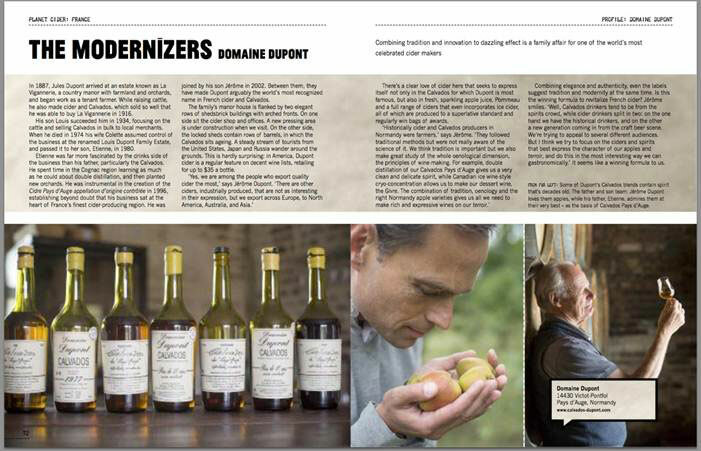 In the Normandy section of this 256-page hardcover book, you may find a profile on Domaine Dupont as well as some of best producers of the area. 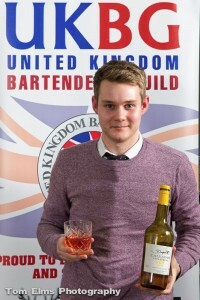 About the authors : Pete Brown writes the UK’s leading beer blog and was named 2009’s and 2012’s Beer Writer of the Year. He appears regularly on TV, radio and in print and currently writes two regular columns in brewing and pub trade magazines in the UK and the US. Bill Bradshaw is a freelance photographer who has been documenting cider for the last seven years as an ongoing personal project. 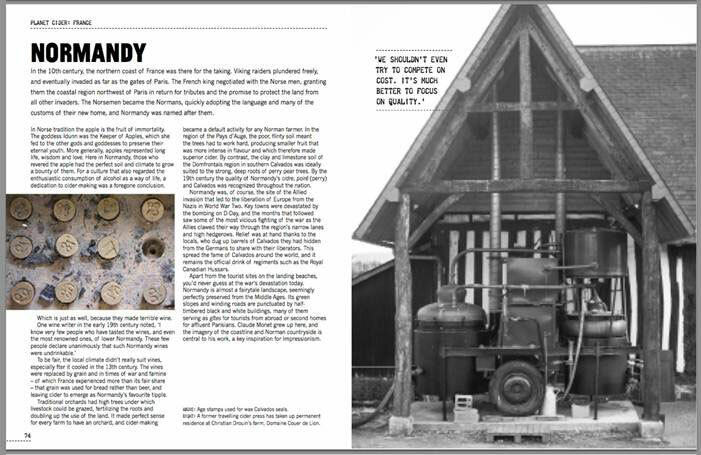 His cider images are on permanent display at the Hereford Cider Museum and he has been published internationally in various magazines including the prestigious Spanish magazine La Sidra. His images and travels are documented on his blog IAMCIDER. Book description : « World’s Best Ciders is the first book to showcase the world of cider, from its origins as a thirst-quencher for farm workers to its present as a rival to champagne. Travelling from the Old to the New World and teaching us not only how to taste it but how to cook with it, Pete Brown and Bill Bradshaw explore every aspect of this fascinating drink and the people who produce it. Here you’ll discover what Johnny Appleseed really planted, find out what the Magners’ effect is and learn why perry is a miracle drink. 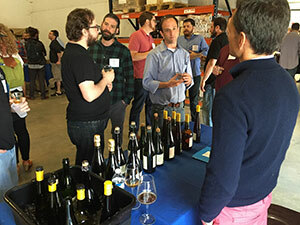 Beginning in the sidrerias of Asturias, Spain, where cider has been part of the culture for thousands of years, the authors then travel north to Normandy and Brittany in France, to the famous cider regions of Somerset, the Three Counties and Wales in the UK and then across the Atlantic, to New England and Quebec where cider is being re-invented, taken out of bars and into restaurants. Over 200 ciders are described in detail, with tasting notes, and illustrated with hundreds of Bill Bradshaw’s inspiring and beautiful photographs. 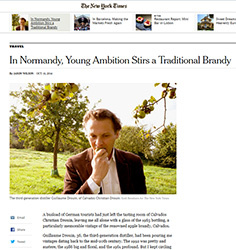 Titled Calvados’s Warm Charm – Have an apple-y ever after fall with this popular Normandy digestif, the article is a nice introduction to Calvados. 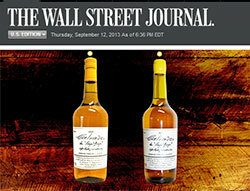 Will Lyons quotes Jérôme Dupont and the graphics displays (and presents) two Dupont Calvados (VSOP and Vintage 1997). 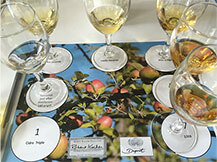 Long time cider enthusiast and connoisseur, James Adams presents the Dupont Estate in his blog All About Cider. 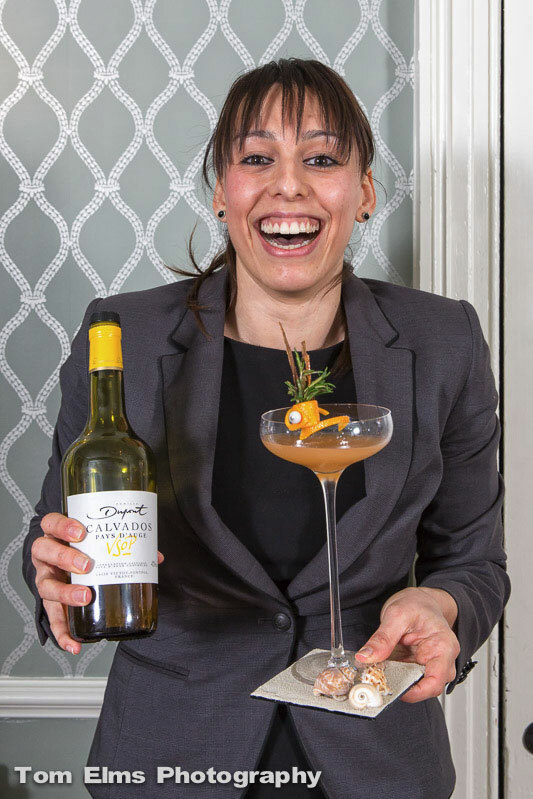 When the New York Times captures a well-known fashion stylist dining at the Calliope Restaurant, there is a Domaine Dupont Organic Cider on the table ! Calliope Restaurant is located 84 East Fourth Street in NYC. 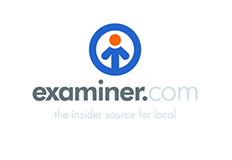 The TODAY food newsletter, Bites on Today, publishes an interesting article about cider titled Not your granny’s apple cider: Craft varieties make a comeback. My name is Galen Mercer and I am a painter, living in Vermont, USA. 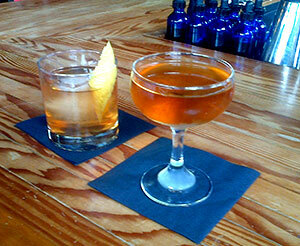 Being a great fan of calvados, I’ve long enjoyed your Domaine’s excellent product, as well as your various ciders. Several years back, a friend made me a gift of Dupont Vielle Reserve calvados. Upon finishing it I kept the bottle, finding the particular shade of olive glass to be quite lovely, while also admiring the vivid yellow seal. At the time I thought it might make a nice prop in a still life painting. 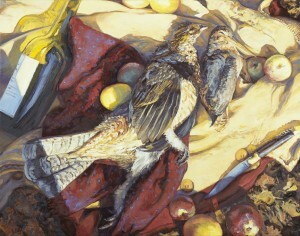 I recently completed a study of game (a woodcock and a grouse) displayed after a hunt, into which I placed your bottle, which added both form and an elegant splash of color to the piece. Reviewing your website the other day gave me the idea that you might enjoy seeing this piece. In hopes that you might find the artistic re-purposing of one of your bottles to be of interest, I am sending you a scan. With thanks again for the care and obvious pride you take in your particular art.